For information about purchasing a quilt, please contact me. 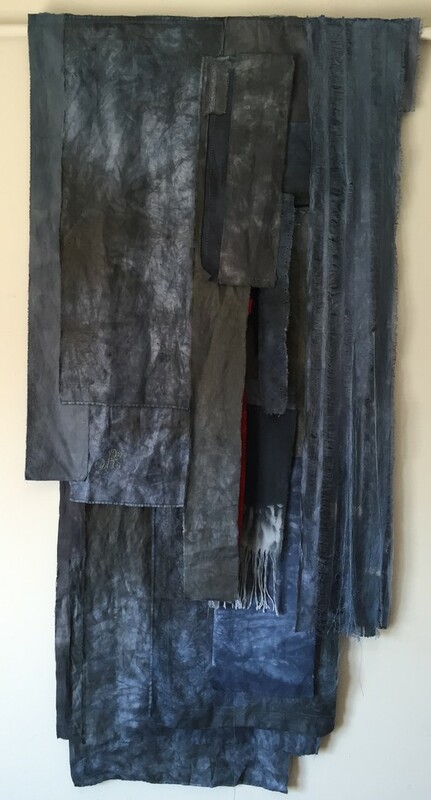 Borders, 24.5 x 34.5", heirloom cotton and linen fabrics, hand dyed, machine stitched. 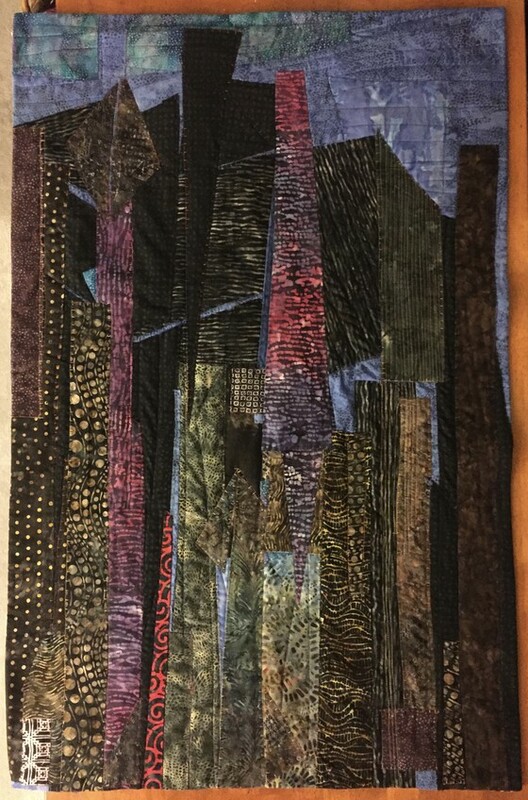 Night City, 28 x 44" (formerly City Fragment), cotton batik fabrics, December, 2017. In honor of the 50th Anniversary of Fermi Lab. 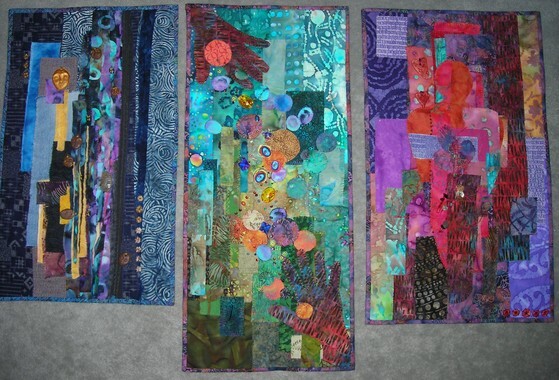 34 x 44", batik cotton fabrics, machine quilted and hand embroidered with cotton, silk, wool, linen, and steel wool fibers. April, 2017. Seeing Red, 12.5 x 68", handstitched raw-edge appliqué, machine finished, cotton batik fabrics, January 2017. 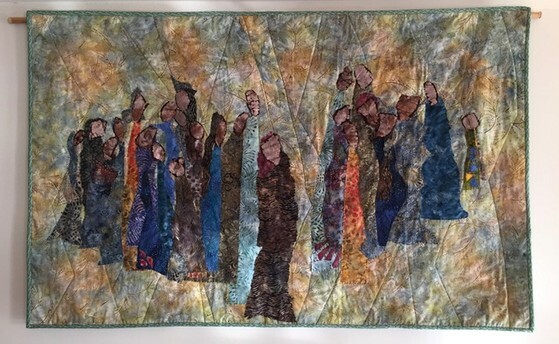 Pilgrimage/The Genuine Heart of Sadness, 45.5 x 29," handstitched raw-edge appliqué, machine finished, cotton batik fabrics, December 2016. Grant Park Summer, 31 x 48", cotton batik fabrics, machine stitched, October 2016, Sold. In memory of Drift, February 6, 2008 - June 9, 2016. 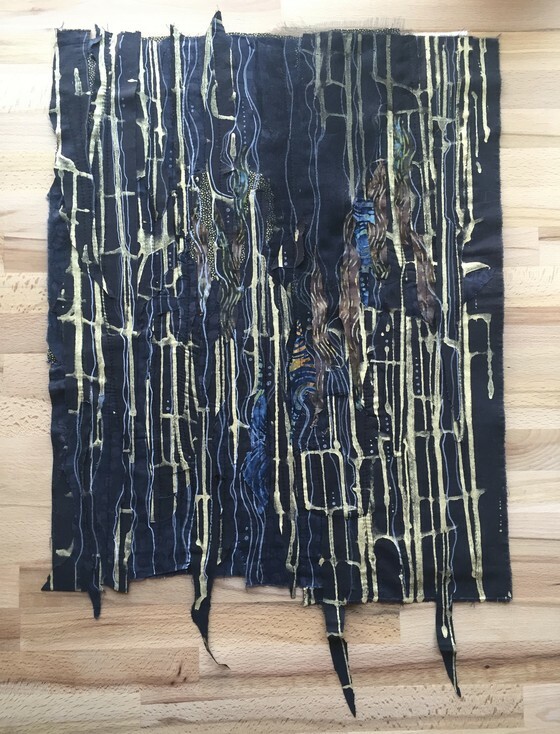 Potato-dyed cotton and batik fabrics, cotton thread. Approx. 50 x 50", nfs. 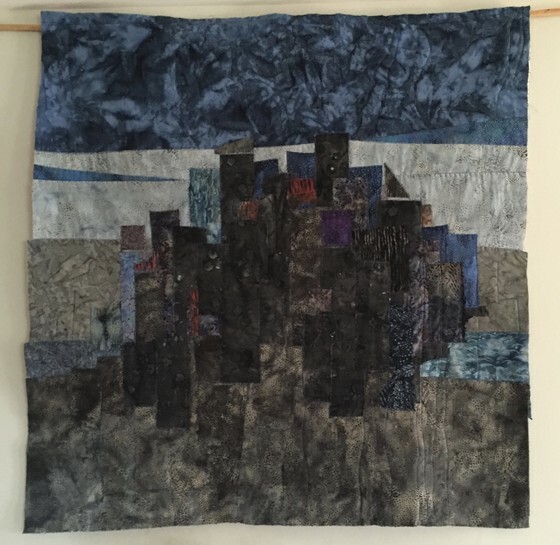 The Life of the City is Underground, 44 x 41," potato dyed cotton and batik fabrics, machine stitched, January 2016. 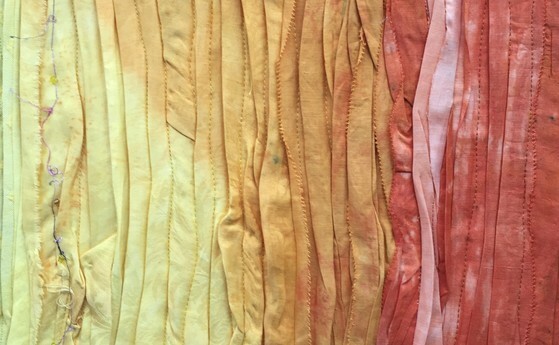 Detail, Color/Stitch Test, Hand dyed cotton and linen fabrics, machine stitched, January 2016. 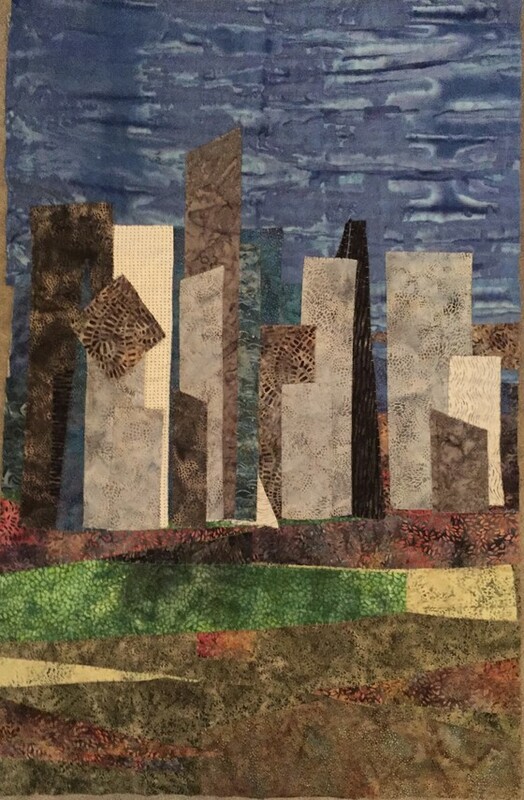 City in My Mind, 42 x 40," cotton fabrics, cotton thread, November 2015, nfs. 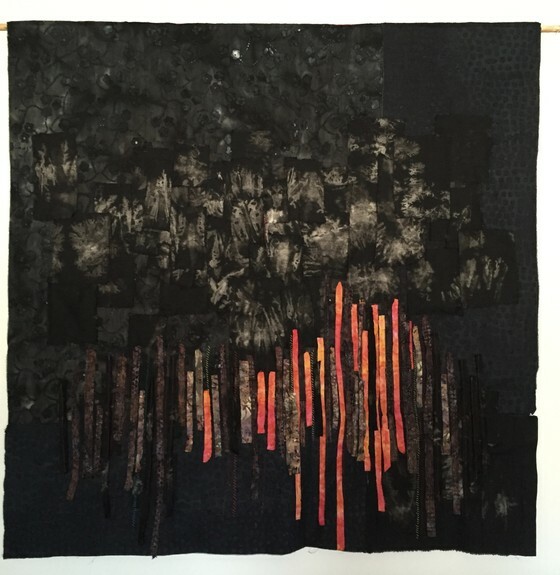 Remembrance, 22 x 24," cotton fabric, wool roving, cotton batting, glass beads, twigs from my garden, November 2015. 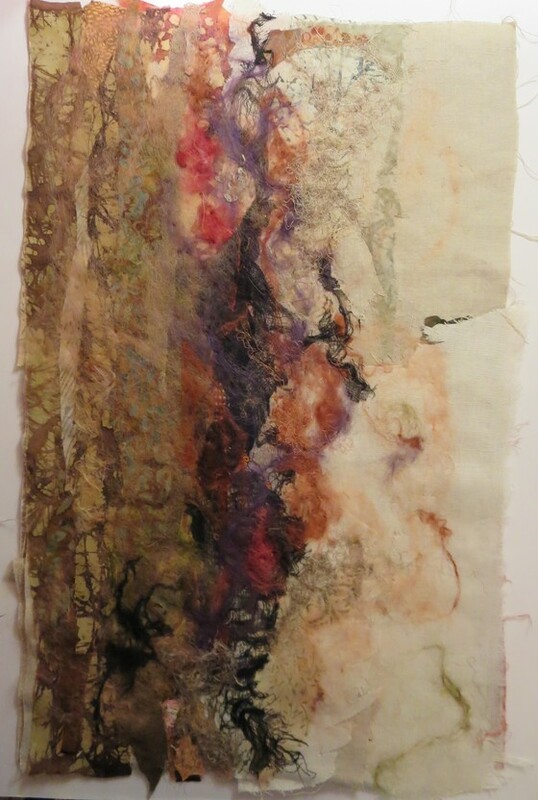 A Thousand Ways up the Mountain, 27 x 36," cotton fabrics, November 2015. Flesh and Bone, 17 x 24," cotton fabrics, October 2015. 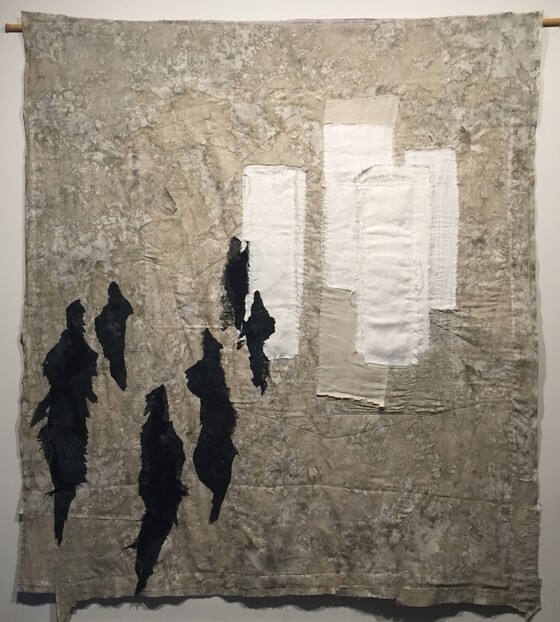 Dark Horses, 45 x 51", hand painted cotton and linen fabrics, cotton gauze, raw edged appliqué, cotton and silk threads, June 2015, nfs. Evoking the Tibetan prayer flags which inspired them, this grouping of five panels sends prayers of compassion and peace into the universe as the wind stirs the fabrics into movement. 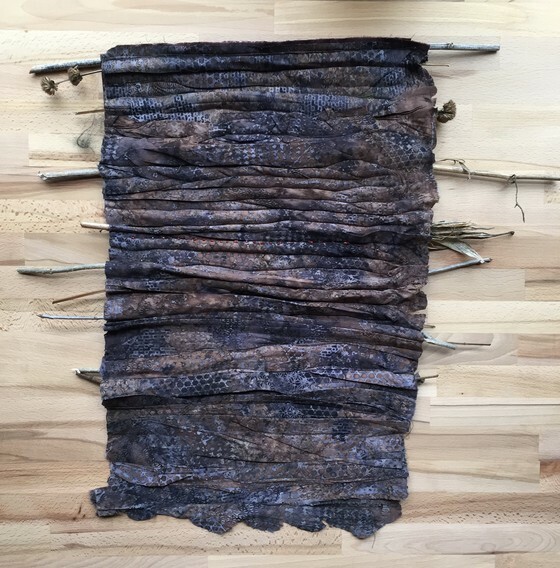 Four panels are made from hand-dyed linen, cotton, and silk vintage textiles that belonged to my mother and grandmothers. 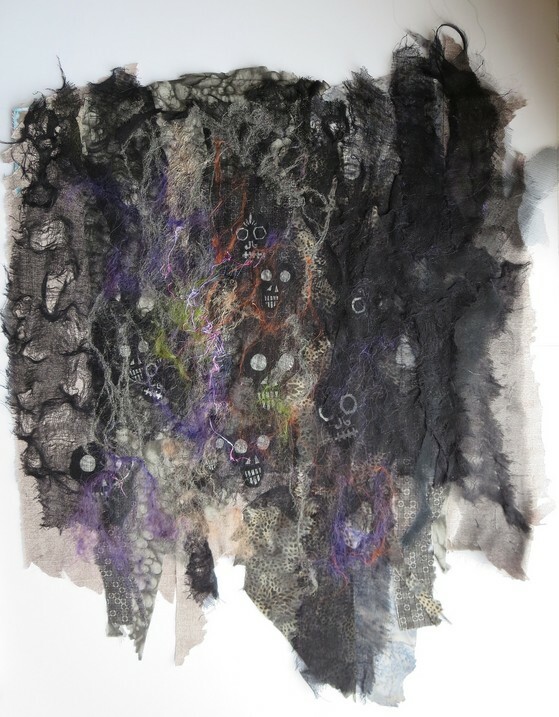 The fifth and central panel, "Selves and other Icons," is made of hand stitched batik fabrics which depict images we hold of ourselves and others, real and imagined, and the power within each of us to transform ourselves and our world. 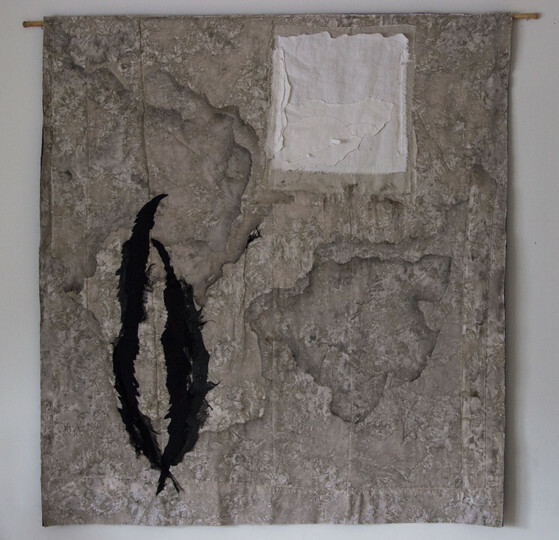 Selves and Other Icons, 33 x 44" raw edge appliqué, commercial batik fabrics, silk and cotton threads, June 2015. 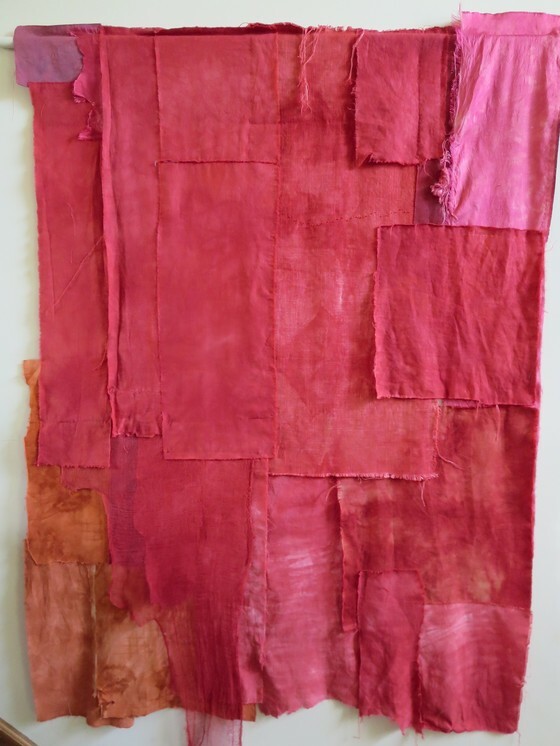 Maroon with Pink Square, 30 x 62", hand dyed vintage linen and cotton fabrics, silk and cotton threads, June 2015. 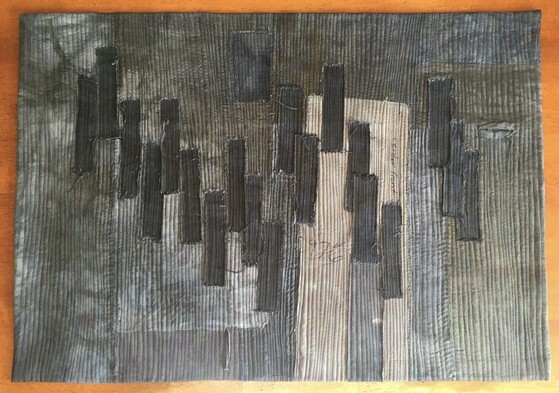 Transcend, 28 x 60," April 2015. Hand dyed cotton, linen, silk, with silk thread and wax, nfs. 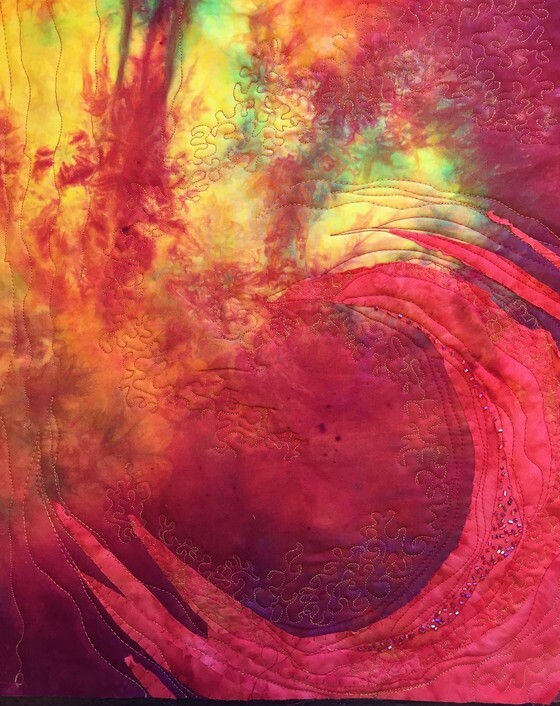 Blood Moon, 12 x 14," cotton fabrics, glass beads, January 2015. 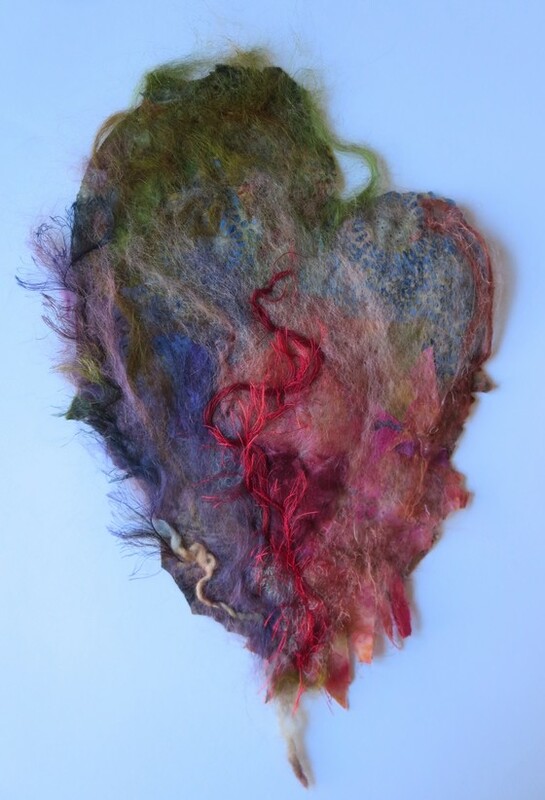 The Genuine Heart of Sadness, 9 x 14," cotton, wool roving, unspun and spun silk and wool, September 2014. 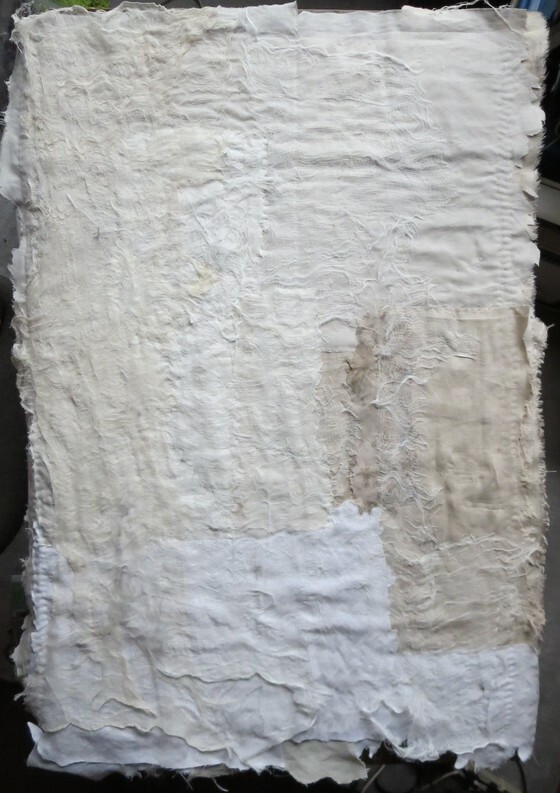 Material Space IV, take II, 28 x 40", cotton, linen, gauze, silk threads, glass beads, July 2014. 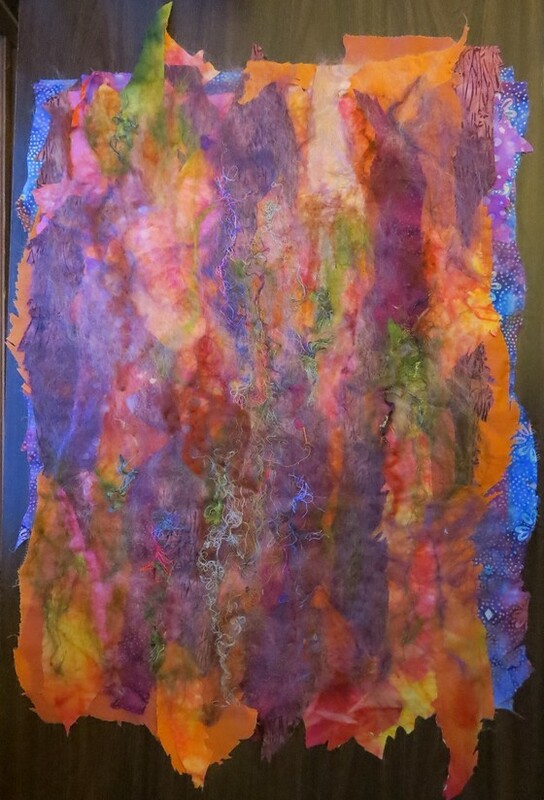 Spring Equinox, 22 x 29", cotton fabric, overlaid with unspun and spun silk, wool roving, February 2014. 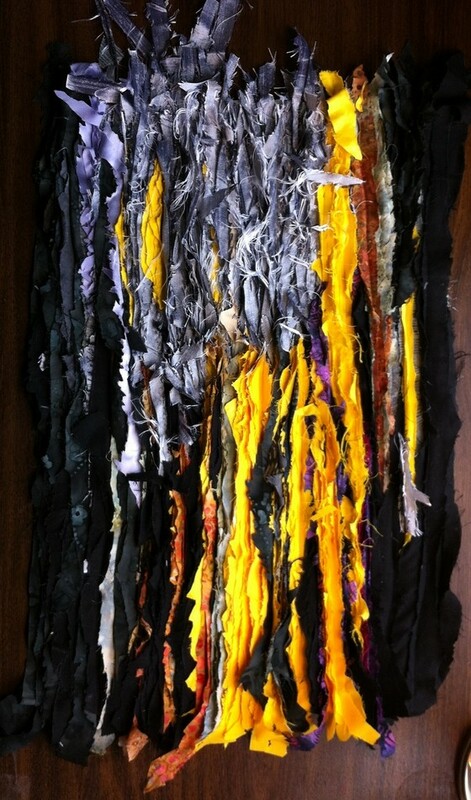 Material Space II, 21x 26", cotton and linen fabrics, overlaid with unspun silk, wool roving, steel wool, shredded gauze. January 2014. 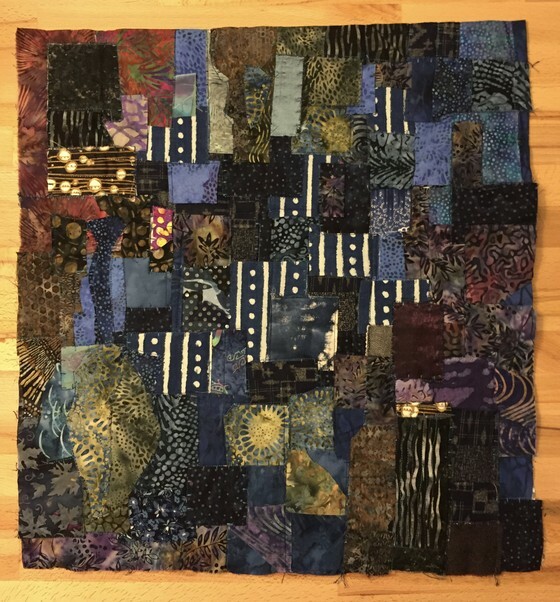 Grief, 44 x 48", handpainted cotton and silk fabrics, December 2013, nfs. 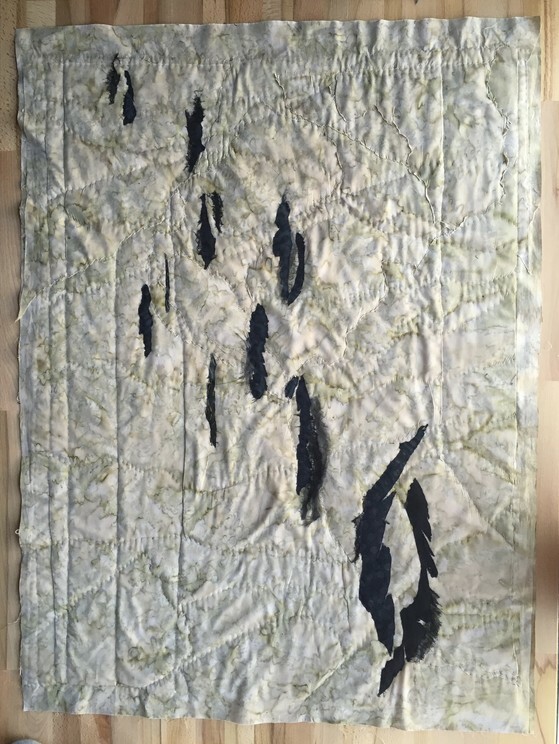 Lake, 46 x 121", cotton fabrics, cotton thread. March 2013. 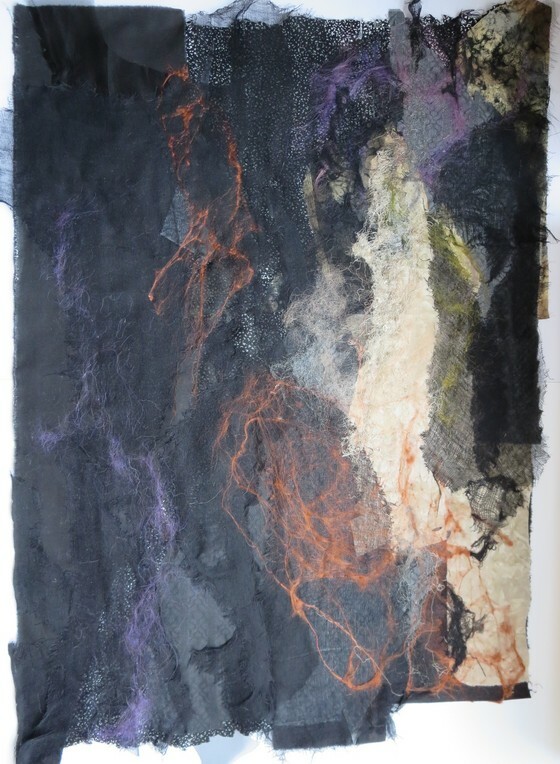 Textile, 18 x 20", hand dyed cotton, linen, canvas, silk; cotton thread. May 2013. 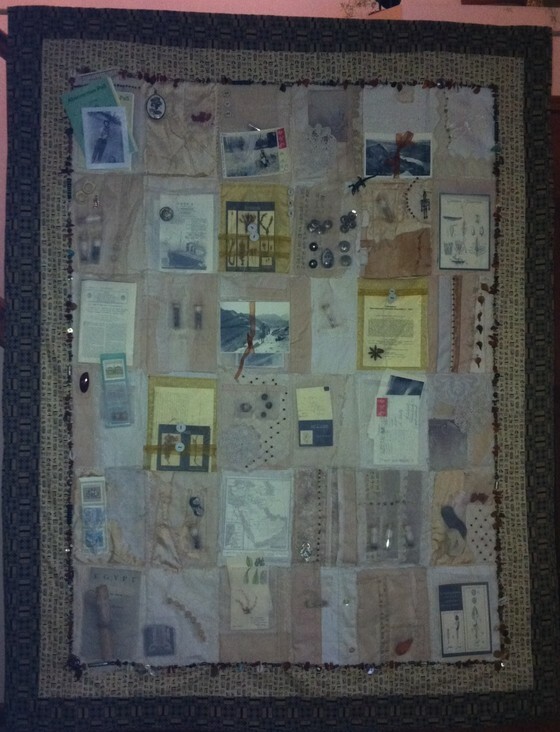 Six Six by Six quilts: Moon/Sun; Death is the Glass of Life Broken/Peace; Hand/Peace is Always Beautiful. Cotton fabrics, cotton thread, glass beads, metal washers, all 6 x 6." November 2012. 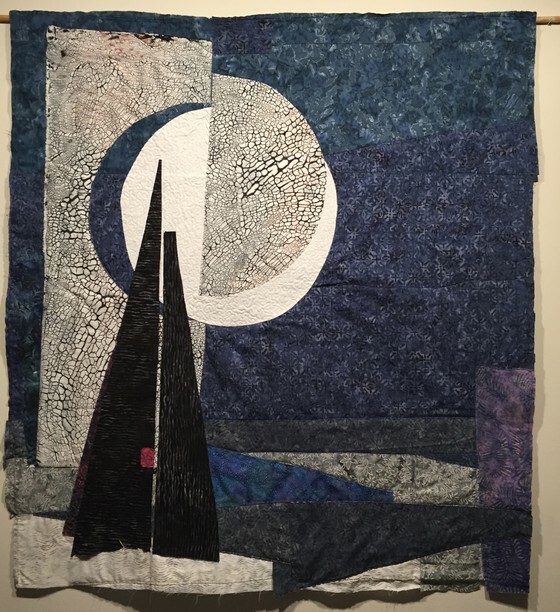 Loss, Longing, Remembrance, Quilt in Remembrance of Polly Ullrich, 2012, gift to David Ullrich. Contentment, center detail. 40 x 42 inches, cotton, silk thread, glass beads. July 2012. 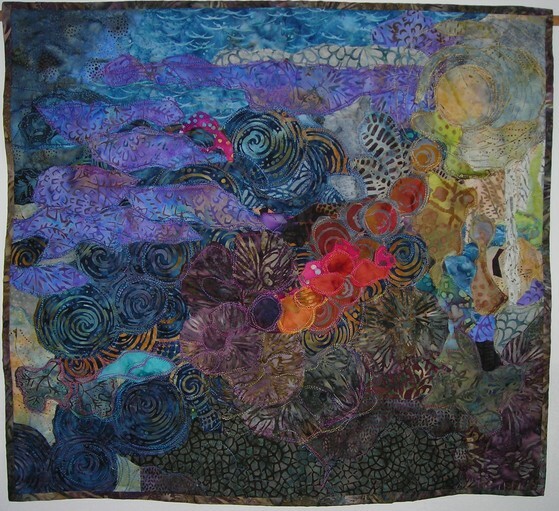 Glass Moon, II, 2012, 23.75 x 58.5," cotton and silk fabrics, machine quilted, hand stitched with glass beads, nfs. 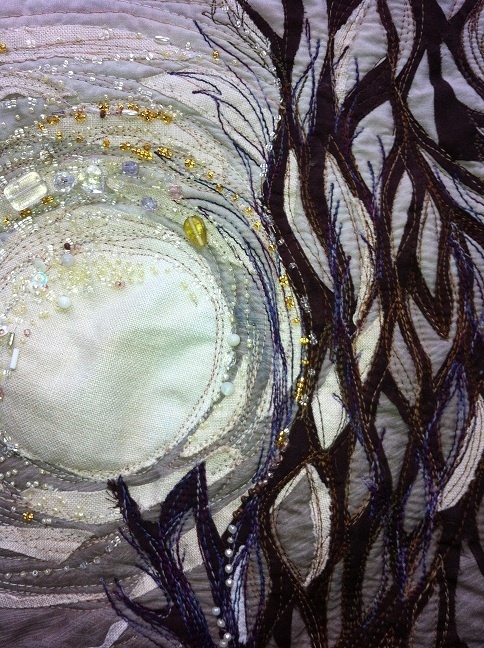 Glass Moon, detail, cotton, silk, glass beads, cotton and silk thread, 2011, nfs. Glass Moon, 23 x 50", cotton, silk, and linen fabrics, cotton and silk thread, glass beads. February 2011, nfs. If Only He'd Had a Sewing Machine, Tribute to Jasper Johns, 12 x 46 inches, cotton, overdyed and bleached cottons, cotton thread, rubber and metal washers, boyscout uniform number, velcro, 2008. 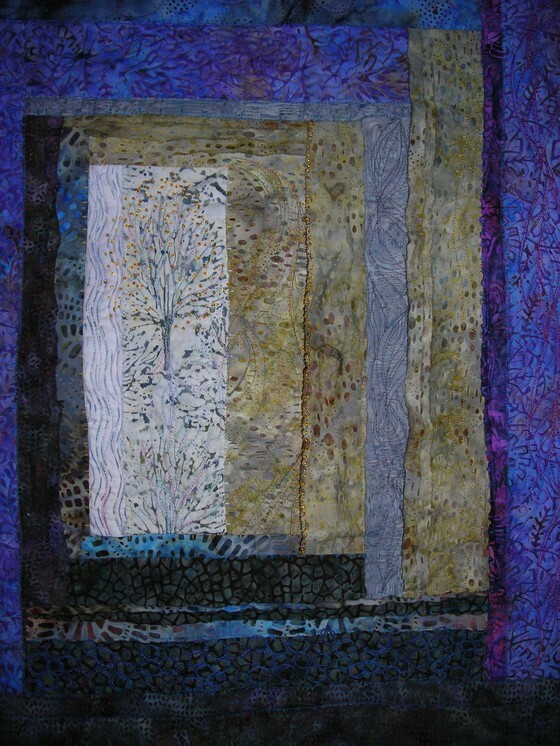 Behind the Compass Church, 11 x 34 inches, cotton, glass beads, December 2011. I saw this tree when I was walking with Drift. The snow is imagined, as it hasn't snowed enough to stay on the ground yet. I loved the red berries decorating the bare brown branches -- a natural Christmas tree. Inspired by the Book of Hours. 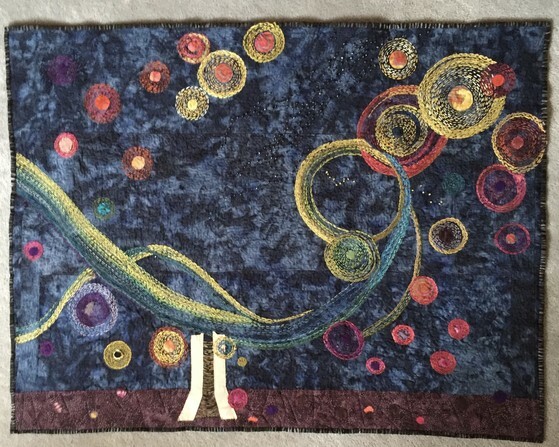 Time Given to Us, 45 x 58 inches, cotton and silk fabrics; glass, amber, silver and turquoise beads; paper; fossils; family artifacts, nfs. This collage is a 'cabinet of curiosities' centered on my mom's and grandmother's travels and the things they collected, including their visas; letters and postcards; many cards of pressed mosses, plants, and botanical sketches of my mom's, in addition to vials of seeds she collected as a student. All rights reserved. Photographs, images, drawings, and text copyright (c) Barbara Leibhardt Wester 2019.